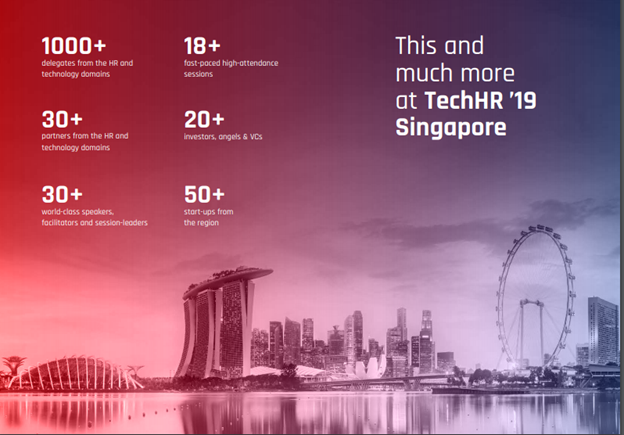 TechHR Singapore to be held on 28th February, 2019 will bring together thought leaders, HR Practitioners, HR Technology product leaders, startups and investors from the APAC region to build a vibrant community that will redefine the future of work. Year after year, Tech HR has broken the traditional molds and has moved beyond being just a “conference” to being an ecosystem of creativity, inspiration, knowledge, and a toolbox for leaders to design the best of tomorrow, today. It has become a watershed event where the focus in not on following the trends but anticipating the future. In August 2018, the 5th edition of Tech HR, hosted at The Leela Ambience, Gurgaon India, saw a gathering of 3000+ HR Heads, CHROs, business leaders, investors and mentors, with 200 HR technology companies, and 28 HR Tech startups showcasing their products to this august gathering. The event has become a focal point for the HR Tech industry as they propel discussions on Technology, Talent and Transformation and anticipate the future. And it is this very future, which we aim to envision for the APAC region as well. In 2019, People Matters will bring this ecosystem to the APAC region, with the first ever Tech HR in Singapore. 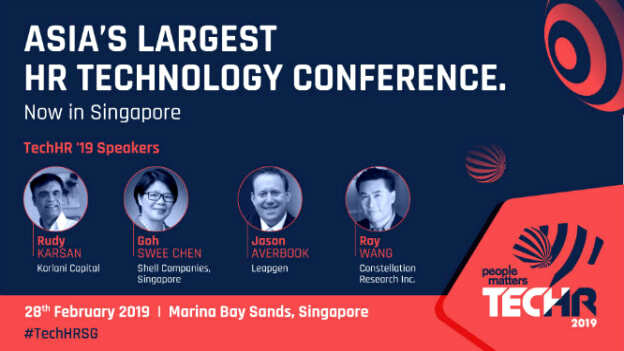 The Tech HR Singapore event to be held on 28th February, 2019 at Marina Bay Sands will bring together thought leaders, HR Practitioners, HR Technology product leaders, startups and investors from the APAC region to build a vibrant community that will redefine the future of work in the region and raise the bar for productivity, innovation and growth. TECH-AS-THE-GLUE: How can technology be employed for productivity and alignment through the employee cycle? Learn from case studies on how most progressive organizations are leveraging technology to transform the way they recruit to adding the tech lens to wellness programs. THE-FUTURE-IS-NOW: Harness technologies that can enable disproportionate leaps in work efficiency. Decode the nuts and bolts of Blockchain in HR Tech to assessing risks in an increasingly tech-enabled compliance framework. DIGITAL-FORCE: Nurturing a future-ready digital force, what does it entail? From a talk show to managing talent in a gig economy to a case study on future-proofing employees, know it all. HOW-TO-DIGITAL: What should be the process of deploying technology within the context of our organizations? From a masterclass on architecting a digital experience to a CHRO's digital roadmap, decode it all. The event will aim to answer the pressing questions which are staring in the face of our changing world of work and talent. • How is digital redefining the notion of productivity for individuals, corporations & nations? • Centralized vs. Decentralized HR Tech Architectures: How to decide what model works best for your organization? • The Blockchain opportunity: Why Blockchain matters for HR Tech and talent leaders? • What does digital really mean in the context of your organization? • How can digital help you integrate a multi-generational workforce? • What is the real opportunity in AI for talent leaders and organizations? • Is your organization ready to move from automated to intelligent reward systems? • How ready are HR Tech startups to scale in the world of work? • What does the workplace of 2025 look like? As you and you organization grapple with these questions, Tech HR Singapore endeavors to bring the answers to you. Click here for attractive early bird offers. In addition, we’ll also be expecting over 50 handpicked HR tech startups from the APAC region to showcase their cutting-edge products and services. So if you are a startup looking to exhibit your product to over 1,000+ attendees in the Startup Zone, meet investors one-2-one and attend exclusive masterclasses, simply fill in this form by November 15 to register at an early bird price of 1500 SGD. Today's incredible pace of technology advancement provides businesses, talent managers and technologists the perfect opportunity to engineer a fascinating workplace of tomorrow. Tech HR Singapore aims to help you design that fascinating workplace. Come, be a part of architecting the future workplace! Want to know what does Asia’s largest HR technology conference looks like? Take a look at this video to get a sneak peek into the world of work, talent, and technology.